"Come and play the game!" The handsome Joker Teddy bear welcomes high society holding a full set of aces. "Come and play the game!" The handsome Joker Teddy bear welcomes high society holding a full set of aces. Additionally, on his real mohair outfit, he wears the four suits in felt - hearts, spades, diamonds and clubs - sewn on by hand. 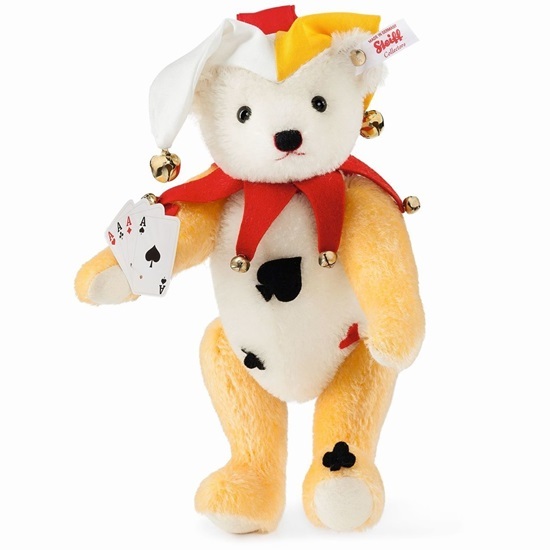 In the casino, our Teddy bear represents a lucky charm: if you hear the bells ring on his cotton jester's hat and on his red felt tailed collar then the right card is very nearby. The white/yellow Joker Teddy bear is 11 inches tall. He wears a gold-plated button in his ear and there are precisely 1,111 of him available. Secure your Joker as a companion for enjoyable rounds of play - and don't be afraid to show him your hand!